Sorry, there are no shows on sale at Gielgud Theatre right now. The Gielgud Theatre is a West End theatre, located on Shaftesbury Avenue in the City of Westminster, London, at the corner of Rupert Street. 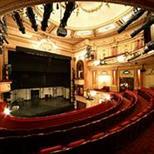 The Gielgud is owned by the Delfont Mackintosh group and seats just under 900 people on three levels. It was designed by WGR Sprague in a neo-classical style and opened in 1907 as the Hicks Theatre, named after actor-manager and playwright Seymour Hicks. American impresario Charles Frohman took over in 1909 and renamed it the Globe, reopening the theatre with a drama by Winston Churchill's mother, Lady Randolph Churchill. It was taken over by Andrew Lloyd Webber's Really Useful Group in the 1980s and refurbished in 1987, it played host to several Ayckbourn premieres and acquired a famous theatre cat, Beerbohm, who on his death in 1995 received a front-page obituary in 'The Stage'. To avoid confusion with Sam Wanamaker's Bankside Shakespeare's Globe project, the theatre's name was changed in honour of the great thespian knight in 1992, and in 2006 Cameron Mackintosh's Delfont Mackintosh Group took ownership and embarked on a further round of refurbishments to both the facade and the interior, which were completed in 2008. The closest tube station is Picadilly Circus, it is approximately 250m away. You can also use Charing Cross. The nearest train station is Charing Cross, it is approximately 550m away. Bus numbers 14, 19 and 38. You can use the MasterPark at Poland Street and China Town or the NCP at Wardour Street, Newport Place, Denman Street and Lexington Street. The access entrance to the auditorium is through the third side EXIT door on Rupert Street. Ask a member of staff to open this for you. One 12cm step up to the front of the Dress Circle. The venue provides wheelchair spaces. Please call 0844 482 5137 for more information and to book. There is a Infa-red system inside the auditorium. Please contact the theatre for more information on 0844 482 5137. Guide dogs are allowed in to the auditorium or alternatively the venue staff are happy to dog sit. To book and for more information, please call 0844 482 5137 or email gielgudbox@delmack.co.uk.